Drones do just about everything now: They take videos, deliver packages and defuse bombs. But they don't carry you around. Chinese drone-maker Ehang has developed the 184, a prototype of the first autonomous drone that will fly humans. The helicopter-like flying machine seats one, and after the flier enters the destination, it will require just two button presses from the rider: take off and land. That's all it takes to pilot the thing. The 184 (one passenger, eight propellers, four arms), isn't ready to fly just yet. There are all kinds of government clearances that it will have to obtain before you can fly by drone to work. But Ehang says it is working closely with government agencies on the technology. Once it goes into production, it will take off vertically (no need for a runway), and land similarly. When in the air, it's capable of speeds of up to 62 miles per hour. 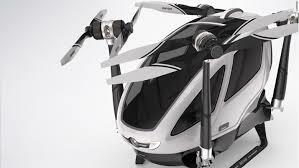 The 184 can travel up to 11,480 feet, and it's got a battery pack that's capable of 23 minutes of flying time. It's tiny too: just 18 feet long. But it's actually capable of being smaller than that: it can be folded into a five-foot space, so it can fit right into a standard parking spot. You can't exactly carry it, but it's light for what it is: It weighs just 440 pounds. For those who are afraid of flying, don't fear (that much). Ehang put all kinds of failsafes on board, including multiple power backups, a program that will land the drone at the first sign of trouble, and an On-Star-like command center for fliers who need help. 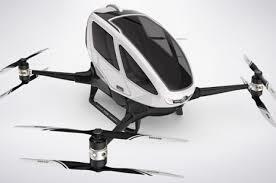 And Ehang promises that it will be much safer than driving, where drivers themselves are the main source of accidents. Ehang hasn't estimated what the 184 will cost yet. But it plans onc continuing to improve the product and get the costs down for when it's able to be produced.